For articles go to Appendix. Quote; “The International Rule, also known as The Metre Rule, was created for the measuring and rating of yachts. Prior to the ratification in 1907, countries raced yachts under their own rules and any international competition was always subject to various forms of handicapping. These were often subjective and certainly open to protest.”, unquote. An exemption was the Scandinavian Kattegat Cup of 1902 to be raced upon without handicap in the 9m Class under the Copenhagen Cruising Rule of 1898. First races to take place in 1903. In 1903 the Copenhagen Racing Rule was replaced by the Copenhagen Cruising Rule for racing. In continuation of the conferences in Copenhagen in 1903 the work for an international rule took place with conferences in London in January and October 1906. Present at the meetings were British, German, French, Austrian, Swedish, Danish and Norwegian sailors. It was a common understanding that the ongoing development in yacht design and international competition called for common rating rules and construction methods encouraging more sound, seaworthy and cruiser friendly yachts. Among the delegates was the Norwegian Johan Anker who later played an important role in the development of the S-rule of 1917 and the R-rule of 1919. Johan Anker had in his youth studied naval architecture in Germany. The rule consists of the same elements as the Copenhagen Cruiser rule. "G" has a reduced penalty factor and “d” has an increased penalty factor, which together with the increased penalty on sail area are encouraging more hull volume, displacement and less sail area. As waterline length increases when healing, length "L" was under the Copenhagen Rule to be measured 5 cm above floating waterline(L.W.L.). If total overhangs exceeded 50% of measured "L", the excess to be added to "L" in the formula. This favoured designs with long and wide, “flat”, overhangs. In an attempt to limit the “flat” (bow) overhangs, measured length "L" in the R-1907 formula is brought back to floating waterline (L.W.L.) with the addition of bow and stern girth differences. In the S-rule of 1917 these two means are combined such as "L" in the Scandinavian S-1917 formula was to be measured 1% of R in meters above floating waterline L.W.L. with the addition of bow and stern girth differences. The R-rule of 1919 adopted the same principle although "L" was to be measured 1,5% of R above L.W.L. For an Eight Metre (R=8), "L" to be measured 1%of R = 8cm above L.W.L. under the S-rule of 1917 and 1,5%of R=12cm above L.W.L. under the R-rule of 1919. The rule as laid down in London in 1906 met some critics. In KSSS, Stockholm, sailors felt the rule would encourage narrow yachts with great sail areas and not become as expected. However, the rule was during 1907 ratified by all sailing nations in Europe creating International Yacht Racing Union (I.Y.R.U.). As had been for the Kattegat Cup, it was of great significance that the International Rule was accompanied by construction requirements, scantlings, to be controlled by Certifying Authorities as Lloyds and the Norske Veritas (DnV). Yachts already constructed and which complied with the construction requirements laid down by Certifying Authorities could claim to belong to the international R-Class they measured. R stands for rating. Classes initially agreed were; R5, R6, R7, R8, R9, R10, R12, R15, R19, R23, A(above)23. Yacht belongs to the Class above or equal to its measurement. A yacht measuring R=7.89 belongs to the R8 Class (International 8 metre Class). USA did not ratify the R-rule of 1907. In America they continued designing and constructing yachts under Herreshoffs Universal Rule for the years to come, as the Americas Cup yachts. The Americans did not ratify the R-rule before after the ammendments of the 2nd R-rule 1928 and the third R-rule came about in 1933 which represented their thinking at the time for medium and small sized yachts. The American ratification was made valid for yachts under the Universal Rules M-class and less. The classes do not directly correspond like for instance “Cotton Blossom” who is designed by Johan Anker to the American Q-class would under the international R-rule of 1933 rate approximately 8,5mR. Moving the Americas Cup from the J-Class to the 12m Class was also a move from the Universal Rule to the International R-rule. The R-rule of 1933 is in view of the Americans the first real International rule. There are still sailors in America advocating for getting back the Universal Rule M-class. In Finland the R-rule came into force in 1908. Many yachts had been constructed according to the American rule of which the designer Wim Gardner was the most consulted in addition to Finland designers as Gunnar Stenbäck, Zaké Westin and Gabriel Geitlin. In 1910 Finland also ratified the Swedish Squaremeter-rule (“Skjærgaardskryssarformelen”) which had come about in Sweden in 1908 by the Swedish designer Karl Ljungberg. Sail-area and minimum displacement were the class ruling factors of the sqm Classes. With less construction cost the sqm class became popular in Sweden. Some yachts were also constructed in Denmark and Norway. In the R-rule of 1907 sail area "S" is included in the formula with a factor 1/3, compared to factor 1 for the measured length "L" and factor 1 for beam "B" and factor ½ for girth "G". During the years to come this had an affect on yacht designers, as they intended to make yachts with limited beam and girths and with large sail areas in order to increase the yachts speed potential. This resulted in narrow yachts, a wet front deck, and less practical for cruising purposes, as feared by sailors in KSSS on the East coast of Sweden, who already in 1907 gained experience with yachts constructed under the international rule. The outcome of this debate was the Swedish Squaremeter-rule of 1908. KNS and Norway ratified the international R-rule on Feb. 25th 1907. Eight yachts were in 1907 constructed by Anker & Jensen to the new rule and among them 8mR “Brand III” who proved her performance in Copenhagen the same year. “Brand III” was sold to Stocholm. In 1914 she sails under the name "Refanut" with owner Jacob Wallenberg. 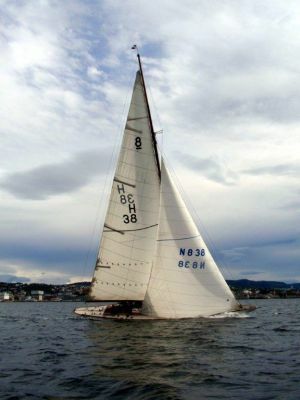 "Brand III" is lately brought back to Norway and was restored for participation in 8mR WC at Hankø, Oslo, 2008. Unfortunately she did not turn up for the races due to rough weather. International Yacht Racing Union (I.Y.R.U.) was established 1907 with offices in London. Alfred Benzon becomes member of IYRU,s permanent committee representing the Nordic (Scandinavian) countries. Just as important as common measurement rule and scantlings was the establishment of common international racing rules. From “Fram” 1908 to “Quinta” 1914 length overall increases from 11.90m to 13.43m, waterline length from 8.07m to 8.34m and beam B is reduced from 2.48m to 2.12m. Girth ½ G in the formula is only slightly increased from 1.75m to 1.78m. [Girth G is under the R-1907 rule measured from covering board to covering board in maximum position closest to max beam B, less 2 times the freeboard in this position. If measurement position is behind 0.55% of waterline length, girth measurement could be taken at any position aft subject to a straight bottom keel and that any measurement aft this position do not exceed the measurement from covering board to covering board with more than 3%] The girth difference 3d is reduced from 0.45m on “Fram” to “Quinta” 0.27m, i.e. the difference between skin girth and chain girth “d” is reduced from 15cm to 9cm. The increase in length with reduction in beam and reduced girth difference confirms the development towards longer and more V-shaped hulls as feared by the sailors in KSSS. Freeboard F is increased from 0.67m to 0.77m, to compensate for increased healing. Sail area S in the formula is increased from 90sqm on “Maud II” in 1908 to 122.4sqm on “Liss II” in 1910. In 1917 “Hazard” ex “Liss II” is listed with sail area 125,91sqm (126sqm). She was an extreme light wind performer and hard to manage in strong winds. In the R-1907 rule sail area is measured as 100% of main + 100% of jib area in front of the mast. (Penalty for jib overlapping the mast, jib sail area behind mast to be added on to S in formula - from 1926 known as Genoa.) There were no limitations on size of running sails in the first R- rule. In Britain the development went in the same direction. 8mR “Garraveen” was designed by Morgan Giles and constructed by Nicholson & Pulton in Southampton 1914. The girth difference “d” = 6.3cm (3d=19) describes a typical V-shaped hull. Her girth (½ G) of 1.74m and max beam of 2.27m describes a hull with modest depth. Her overall length of 14.39m and freeboard of 0.85m is larger than on any of the Scandinavian Eights. The last eight to be designed in Britain before the war (WWI) was W. Fife´s reputable “Ierne”. She was the first eight to be constructed with Bermuda sail plan. In 1910 the British designer Linton Torpe had performed wind tunnel tests which proved that tall, narrow sails had better performance upwind and even side-wind than the wide and lower gaff sail. This had been experienced by Johan Anker during the olympic races in Ryde, Isle of Wight 1908 where the British yachts proved to be superior with there higher and not so wide gaff sails compared to "Fram". 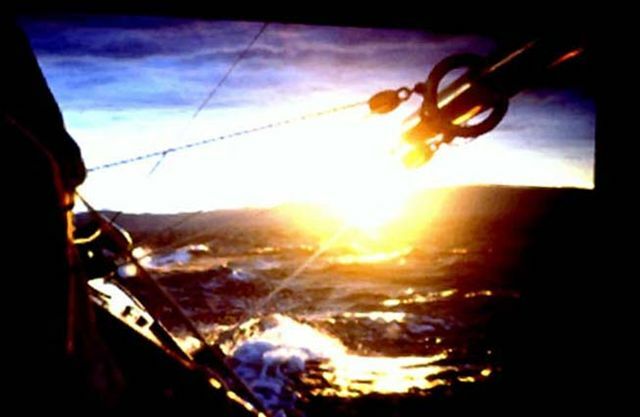 When proven, this fact resulted in raising the gaff and combining the main sail and topsail, named Gunterlug rig. Further lengthening of the mast and fixing the top sail to the mast, and then the longer mast with one triangular mainsail, the Bermuda sail. 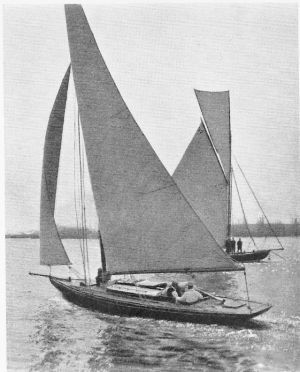 In 1913 two of Anker & Jensens 6mR yachts constructed that year was fitted out with Gunterlug respectively Bermuda sail plans, of which “Mosquito” with the Bermuda sail proved to be superior. Further the Bermuda rig proved lot easier to handle for the crew than the gaff rig. Still there were lots of doubts about the Bermuda sail plan on larger yachts, Eights and upwards. Doubts were related to height and weight of masts with increased centre of gravity above deck. The longer masts had to be supported by spreaders and wire, the Marconi rig. There were under the R-rule of 1907 no restrictions on size and weight on spars except that hollow masts were not permitted for classes above 10mR. Glue and gluing technique was not at hand to make tall, strong and hollow lightweight spares. Mast breakdowns were not unusual on the longer masts in rough weather. “Symra” (1914) was the first 12mR with Marconi rig and Bermuda sail plan designed and constructed by Anker. She proved under the “European race week” in Horten the same year to outclass her gaff rigged competitors, “Sibyllan” (Anker 1913) and “Erna Signe” (Fife 1912). Europe was at war, which strongly affected the activity of I.Y.R.U. in London. The designers had the same understanding that the development was not going in the right direction. In Scandinavia Johan Anker designed 8mR “Guri” which V-shape was more extreme than any of Ankers previous eights, d=6.7 cm (3d=20cm) and beam B=2.10m. The Swedish designer Nygren constructed 8mR “Tuttan” with d=5.7cm (3d=17cm) and beam B=2.17m. New Eights were to be designed with Bermuda sail plan. Masts got taller and healing power increased for upwind sailing putting more demand on increased stability. The compromise had to be reduction in sail area in the formula allowing for increase in hull dimensions and stability with increased keel ballast. “Garaveen” designed by Giles in 1914 was a forerunner for this development, although she was fitted out with gaff rig. Several of the British Eights, “Garraveen”, “Ierne” and “The Truant” (Fife 1910) were during the war exported to Norway, which at the time had one of Europes largest fleets of racing R-yachts. “Garraveen” was during the early 1920-ties fitted out with Bermuda sail plan and proved to be a strong competitor to “Ierne” who won Gold Medal in the old Eight Metre Class under the Olympics in Antwerpen 1920. This was a development in the right direction and you may say that the R-rule of 1907 was not fully explored when it was replaced by the Oct. 1919 2nd R-rule from Jan 1st 1920. In Britain the development before the War indicated larger hulls and less sail area in line with what was going to be the outcome of the new rule. However, this had no particular effect on the V-shape as long as beam B in the formula remained, advocating for narrow hulls. As such a modification of the rule encouraging more cruiser friendly yachts was already overdue in 1915. An unwanted fact for the construction yards was that the larger hulls would be more expensive and harder to sell. Compared to other racing classes as the 75sqm class, the 8mR-class was too costly for the average yachtsman. For Johan Anker who at the time was running one of Europes largest yacht construction yards, Anker & Jensen in Vollen outside Oslo, this was a great concern. The alternative was to look for a revision to the formula holding on to the size of the hulls but reduce the V-shape, and put more penalty on sail area. The Bermuda sail proved more efficient for upwind sailing even with less sail area and only down wind the large gaff rigs gave more boat speed. Discussions on how to turn the development and reflect this in a revision to the measurement rule took place. The R-rule of 1907 had been made valid for a period of ten years and was up to revision as of December 31st 1917. In many opinions ten years was a too long period, but Europe was in war (1914-1918) and no meeting in IYRU in London could be called for to agree upon revisions of the rule. The Scandinavian countries were not affected by the war to the same extent as Britain and Germany, and the Norwegian designer Johan Anker urged for the Scandinavian designers to agree upon how to turn the development of the yacht design in a more sound direction. Scandinavian Sailing Federation (SSF) was founded in April 1915 with Johan Anker as its first President. The objectives were to continue promoting Scandinavian yachting interests internationally as mutually agreed. One of the first tasks was to agree upon a revision to the international R rule of 1907. The Kattegat Cup was in 1907 moved from the 9m Class under the Copenhagen Rule (S-rule of 1902) to the international 8mR Class. Johan Anker’s 8mR “Brand III” wins the cup in 1907 without competition. No race takes place in 1908 and 1909. In 1910 G.K.S.S., Sweden is the challenger with 8mR "G.K.S.S.1910" designed and constructed by Liljegren and with Tutte Glosemeijer at the helm. The Norwegian defender is 8mR “Condor” designed by Anker 1910 and sailed by Johs. Lunde, KNS. Winner in 1910 is “Condor". G.K.S.S. files a new challenge in 1911, however, they do not come to start and the defender 8mR “Taifun” (Anker 1911) wins on walk over. In 1914 8mR “Astrid”, G.K.S.S. races 8mR “Quinta”, K.N.S. “Quinta’s victory is the fifth victory for KNS. During the European Race Week in Horten “Astrid” becomes the most winning Eight Metre beating "Quinta" in 3 of 4 races. GKSS wins the new cup to Sweden in 1915 with 8mR “Tuttan” and in 1916 with 8mR “Angelika”. Defender from K.N.S. both years is Ankers 8mR “Guri”. In 1917 8mR “Quinta” fitted out with Bermuda sail wins the cup back to Norway. Contenders in 1917 are 8mR “EA2” K.D.Y., Denmark and “Tuttan” G.K.S.S., Sweden. In 1918 after the ist R-rule elapsed on Dec. 31st 1917 the Kattegat Cup was moved to the new Scandinavian 8mS Class. In 1908 the Olympic games was held in London, and for the first time sailing was on the program with races to take place in Ryde, Isle of Wight. To this first Olympic regatta Norway was represented with 8mR “Fram” designed by Johan Anker and raced by himself. The British designed Eights proved, however, to be superior with their taller masts although “Fram” later proved her designer’s skill in harsher weather at Ryde. Gold winner of the Eight Metre Class in 1908 was "Cobweb", UK., and silver to "Vinga", Sweden . After the Olympics “Fram” was taken ower by Th.Glad, Kristiania (Oslo). In 1911 her owner is Axel Isdahl, Bergen, and in 1919 she is in K.N.S. register listed with owner Wilhelm E. Trumphy, Bergen. In K.N.S. register 1937-38 “Fram” is without sail racing no listed with homeport Trondheim and owner T. Bolderslöw-Kvärnö. Other Eight Metres in Trondheim at the time are H19 “Lucie IV” (Anker 1912) owner Odd Östlund, and H20 “Sarina” (G.U.Laws 1912) owner Bernhard Wessell. In the1912 Olympic Regatta in Nynäshamn outside Stockholm there are eight (8) entries in the 8mR Class; Sweden 2, Finland 2, Norway 2 and Russia 2. 8mR “Taifun” wins Gold medal for Norway. Silver medal goes to 8mR “Sans Atout”, Sweden (ex “Atair”, Anker 1908). The Norwegian 8mR “Lucie IV” (Anker 1912) is present in Nynäshamn but not racing. “Taifun” is in 1915 acquired by Wilhelm Hoff, Trondheim and races for some years in Trondheim before she in the early 1920-ties returns to Oslo. In 1917 “Lucie IV” follows “Taifun” to Trondheim. Her name is “Magel” and owner Peder Jystad who enters into a partnership with late Ole Östlund (1874 – 1967) who later becomes her only owner. “Lucie IV” and “Snarken” represents the continuity in Eight Metre sailing in Trondheim (ref. “Snarken” history part III). Go to: S-rule of 1917.